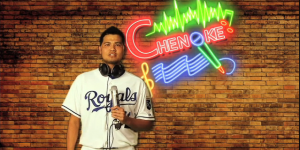 Bruce Chen Facts: When Singing Chenoke, He Pretty Much Kills It | That's Twins Baseball. A Minnesota Twins Blog. The legend of Bruce Chen continues to grow. He already strikes fear into the hearts of AL Central opponents with his Konami Code fast ball that moves up, up, down, down, left, right, left, right, B, A, B, A, select, and start….all before it is halfway to the plate. Now he is striking fear into the hearts of Tony Bennett and even the dead Frank Sinatra. Bruce Chen pretty much kills it when he sings. So much so that out of respect, the word karaoke is now called Chenoke. Listen below and ladies, you better be sitting down for this. Here he is ladies and gentleman. The Kansas City Crooner, Bruce Chen! How great was that? This was from last summer so I apologize if some of you were lucky enough to see it. Hat tip to @AndrewPohlman for the link. Be sure to click on the link below for more Bruce Chen Facts.